When you see a beautiful image, an image that tells a story, you can be sure that a lot of thought went into it. Photography may seem such a quick medium – after all, you only click the shutter and there it is, you’ve taken a photograph. But to make a photograph…that’s something quite different. There’s so much going on behind the scenes: you need to know how to use your camera, how to manipulate light, and how to compose the photograph so that all the elements in it work as a whole, and come together to tell the story you had in mind. Visual storytelling is a combination of technical knowledge, creative vision, and the desire to express yourself, to tell your story, through images. I love creating, and I also love sharing what I know with others. My online courses are all designed to help you grow, express yourself, and shine your own beautiful light. 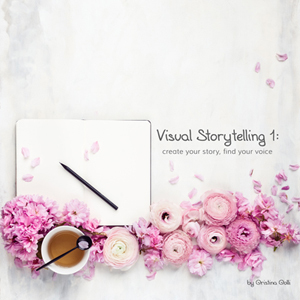 ‘Visual Storytelling 1: create your story, find your voice’ is the first in a series of courses on visual storytelling. In visual storytelling, every element in the image has a meaning, and is there for a reason: to evoke an emotional response in the viewer. Every choice you make when taking a photograph sends a message and tells a story. As a blogger, brand, maker, Instagrammer, or creative person, I’m sure you know how important it is to create images that represent your story and values, and communicate your message with a clear, consistent style. The first step for effective visual storytelling is figuring out what the story behind the image is – after all, how can you tell a story, if you don’t know what it is? The moment you find clarity on what you want to say, is the moment you start developing your own photographic voice, and infuse your images with your message. 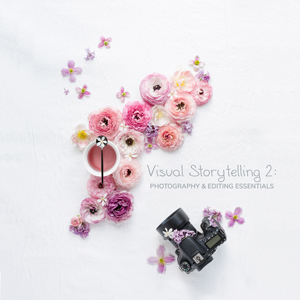 Visual Storytelling 2: Photography & editing essentials – COMING SOON! If you want to create beautiful photographs that evoke emotions and tell a story, you need a mix of creativity and skills. Visual Storytelling 2: Photography & Editing essentials gives you the fundamental skills to use your camera as a creative tool, and bring your vision into reality.